Now over 70 hours have passed since the Shenzhen landslide in southern China happened, and rescuers are fighting against the clock, seizing the last few hours of the 72-hour golden window to search for more survivors. 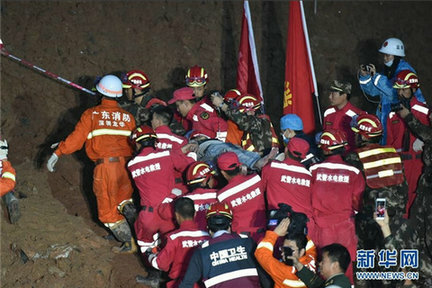 On early Wednesday morning, rescuers successfully pulled out a survivor, after nearly 20 hours of excavation, dismantling work, and on site medical care. The male survivor, named Tian Zeming, is now in stable conditions in the hospital. Also this morning, the rescue headquarters have held a press briefing. The headquarters have divided the site into 16 search zones, with life signs detected in 4 search areas. They also set a main task for the next step, which is to locate the buried buildings with the help of various technical equipments, as the buildings have been displaced by the landslide. They will expose the roof of the building, then penetrate through the roof to find more survivors. "At the instruction of the rescue headquarters, we have made saving lives our top priority. The most important thing for rescuers is to locate the buildings. Now 14 buildings have been located and marked,"
"We are continuing excavating at the other sites. Once a building is dug out, we will then conduct thorough detection, and then determine what kind of rescue plan to adopt," said Wang Guoshe, Commander of Guangdong Provincial Fire-Fighting Brigade.